Caesars01493 731731work Amusement Park/ArcadeCaesars in the village of Hemsby near Great Yarmouth is a family amusement arcade with something for everyone. Caesars in the village of Hemsby near Great Yarmouth is a family amusement arcade with something for everyone. Take the A149 out of Great Yarmouth signposted for Caister-on-Sea and follow the signs through to Hemsby. 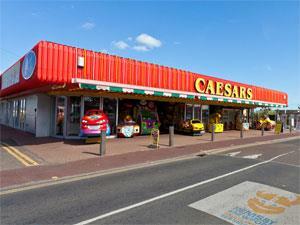 Caesars is located on Beach Road, take a right turn at the mini roundabout on arrival in Hemsby.